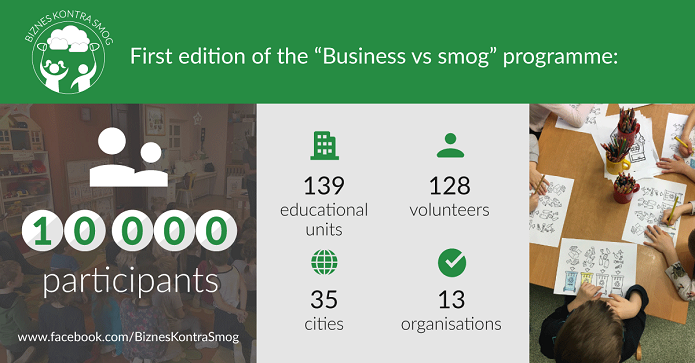 Over the winter, 128 volunteers from companies operating the “Business vs Smog” programme trained almost 10,000 children and young people in caring for clean air and preventing smog. A total of 139 educational establishments, mainly from the regions of Silesia and Lesser Poland, participated in the programme. This is the first agreement of such a scale between companies aimed to improve the quality of air in Poland. Another edition of the programme is planned. The “Business vs Smog” employee volunteer programme was created on the initiative of the consulting firm PwC, under the auspices of Krakow Smog Alert and the ASPIRE Association, and included 10 companies: Akamai, Amway, Aon, CANPACK Group, Cisco, Hitachi Vantara, Herbalife Nutrition, Jacobs (Ch2M), Wilson HCG and Zurich Insurance Company LTD. The aim of the project is to educate children and young people about smog and clean air. “We believe that good education is the first and maybe the most difficult step towards the resolution of most problems. The positive response from our trainees and their active participation and willingness to continue such training have convinced us that as a business, we have a huge social potential, and for this reason, we are working on another edition of the programme”, says Bartosz Jasiołek, partner at PwC. From October 2018 to March 2019, volunteer employees of all partnering companies and associations conducted training at schools and preschools, explaining what smog is, how it is generated and how it can be prevented. In total, the classes were attended by almost 10,000 children from 139 establishments, mainly from the Śląskie Province and the Małopolskie Province, but also from Łódź and Opole. “Air pollution is a problem that concerns us all. It affects our health and well-being, which are the basis of our quality of life. In addition to legislation and financial programmes, proper education is one of the three pillars of action to improve air quality. By teaching, as early as possible, about the scale and sources of the phenomenon, about what we can do to make the air in our neighbourhood cleaner, we will be able to gradually strengthen positive patterns and behaviours and protect our environment and ourselves”, emphasises Anna Dworakowska, co-founder of Krakow Smog Alert. The “Business vs Smog” programme is the first such extensive agreement in the Polish market between companies in the area of social commitment. “Thanks to the cooperation between these companies, we were able to multiply the opportunities of single groups of volunteers and successfully implement the first edition of this programme, which is much needed in Poland. I am very proud that the ASPIRE companies actively participated in the project and they have already declared their willingness to take part in the next editions”, says Andrew Hallam, General Secretary of the ASPIRE Association. For more information about the project, please visit facebook.com/BiznesKontraSmog. “In response to one of the most important challenges of our society, which is the poor quality of air and natural environment in Poland, we declare our full commitment to the ‘Business vs smog’ programme, working to raise the ecological awareness of Poles”.